The parakeet, also known as a budgie or budgerigar, is a small form of parrot with a flat tail, a small bill and striping on the head and wings. Graceful and energetic, parakeets are flock birds and tend to be very social, both with each other and with their human companions. The budgerigar is native to Australia, and has survived for millions of years in the country’s arid inner regions. They are nomadic, traveling in small-to-large flocks and moving as dictated by food and water needs. Size: An adult budgie is about 7 inches long and weighs an average of 1½ ounces. Plumage: The primary body color is light green. Black mantle markings with yellow accentuations line the wings and head, and most parakeets have purple face patches, black spots on the throat and dark blue tails. 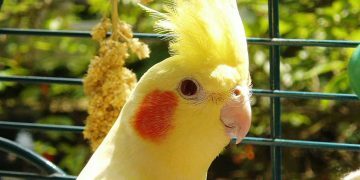 Due to selective parakeet breeding, significant color variations may also be available in your local pet store. Song/Chirp: The parakeet sings an expressive, emotional song that ranges in complexity from a few chirps to lengthier musical phrases and interludes, akin to the song of a lovebird. They also chatter, especially to one another, communicating through a sharp, short series of shrill calls. Male birds do the singing, which may include completely unique sound combinations that no other individual bird can replicate. 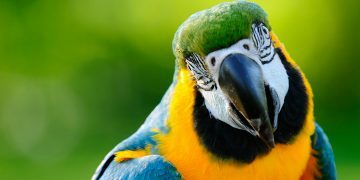 Given the importance of the flock in the life of a parakeet, it’s vital that these birds be kept in at least pairs, if not groups or families. These birds are also curious and playful by nature, so it’s important that parakeet cages include a selection of bird toys to keep your pet occupied. Proper parakeet care also includes time out of the cage each day, which should include interaction with humans or other birds. Talk to a bird professional if you have other behavioral questions about parakeets. Feeding: Good parakeet care includes a diet consisting mainly of soaked, sprouted or dry seeds, but with added supplements. Slip whole grains, edible flowers or greens, fruit, legumes, pellets and some meats into your bird feeder regularly, too. 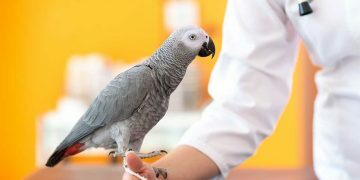 Grooming: Beyond providing your bird with clean water to bathe in and an occasional nail trimming, you won’t have to worry much about grooming your pet. Also keep in mind that rhubarb leaves, alcohol, avocado and chocolate are very toxic to parakeets. Your bird may well die if it ingests any of these substances. Life Expectancy: Parakeets live an average of 12 to 14 years. Breeding parakeets is a well-established science, and there’s no reason you should take home a bird that’s any less than completely, 100 percent healthy. Avoid any birds that seem unusually sluggish or quiet, don’t seem to be alert or have poor posture. Hand-fed, pet-quality budgerigars are usually available for about $10 to $20. Quaker parakeets are more expensive, usually selling for $100 to $200.